Tired of getting that blank look when your children read the instructions to a math problem, especially when you are certain they know how to do the work? Often, the problem isn't the math itself that confuses the child, but rather, understanding the terminology. This booklet covers 16 commonly used and easily forgotten math terms. Memory Triggers utilizes the same FUN mnemonic approach used so successfully with Times Tales. Simple pictures and stories combine to trigger your child's memory to remember the meaning of the term and what to do to solve the problem. 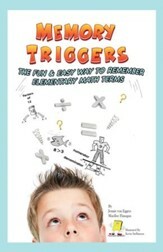 This is a great tool for any elementary age student struggling with remembering commonly used math terms. Put an end to questions like, "What does denominator mean, again?" A messy room can be overwhelming to kids! Give them a step-by-step guide that will have them done and playing again in no time. The Times Tales Mini Bedroom Cleaning for Kids Clean 'n' Flip book walks students through an easy-to-follow progression, from making a messy pile and sorting items to finally making the bed. 9 pages, flip-top format. 5.5" x 4.25". 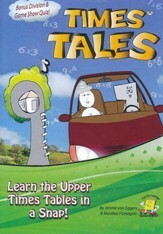 Times Tales DVD is a creative, innovative mnemonic-based program that makes it fun and easy to memorize the upper multiplication tables. Times Tales uses cute, simple stories to provide students with a "memory peg", allowing them to quickly recall otherwise abstract facts. There are many chore systems and checklist systems, but Zone Cleaning for Kids goes a step further by training children how to properly complete their chores--while tracking duties and progress! This unique chore system is designed to help children visually, systematically, and independently work through cleaning the kitchen, living room/entry, bathroom and bedrooms. Step-by-step illustrations make chores simple -- non-readers can easily follow along! Simply flip to the first page in the laminated flip chart and follow the illustrated instructions. Use the included dry erase marker to check the box then flip the page. Customize the system with blank lines in each zone to list additional daily jobs to fit your family's needs. There's even a spot to note desired completion times such as "morning" or "evening." The instructional DVD shows Mom how to best utilize the system and trains children in the proper way to complete each task. A fully-laminated flip chart, allowing for all sections to be checked with a dry-erase marker and/or customized by Mom with a wet-erase marker. An instructional DVD that walks children through the process, demonstrating the correct way to complete each task, as well as parental tips on how to best utilize the program. Basket labels used for cleaning the bedroom. Kid-friendly Cleaning Solutions E-Book filled with frugal, non-toxic cleansers you can make yourself. Access to a purchaser's-only page listing a variety of homemaking and organizational resources.